On July 30th, 2016 in Los Angeles, CA Miss West Coast Productions Inc. will host the 3rd Annual Miss West Coast Regional Pageant where over 80 contestants will compete to capture the crown! Celebrity Host Jai Rodriguez who is an Emmy Award-winning TV host, broadway performer and actor will host the 2016 Miss West Coast Pageant. Jai Rodriguez is most recognized for his role on Queer Eye For The Straight Guy and is currently the host of Dance Moms and can be seen in the Netflix hit series Grace and Frankie and The Bold and the Beautiful. Also, Red Carpet Host and Co-Host Nia Sanchez Miss USA 2014 will be there! Please click on image below to view full article. The Miss West Coast Pageant hosted an Aqua Swim swimsuit photo shoot Sunday, July 26, in Malibu. The photo shoot had some local sponsors on board, including Blue Malibu and CVS Pharmacy. Additional sponsors were Glad Lash, April Love Pro Make Up Academy, Sweets Jewelry, Aqua Swim Swimwear, Vita Coco Coconut Water, Hollywood Stars and Rock God Eyewear. Overall, the Miss West Coast Pageant includes more than 90 contestants ages 8-45 in four age categories: Junior, Teen, Miss and Ms.
Malibu resident Rachel DeAngelis is the only Malibu resident is competing in the pageant’s junior division, and is the only Malibu resident in the competition. Miss West Coast Pageant is a preliminary competition to Miss California USA/Miss California Teen USA, where competitors in those pageants are often found. 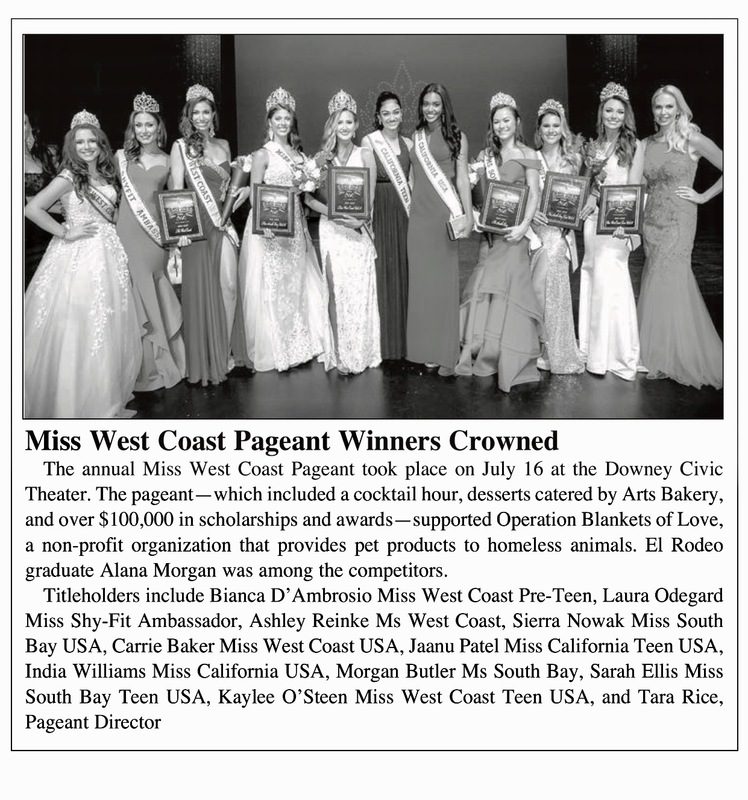 The Miss West Coast Pageant is held on August 29 at The Morgan-Wixson Theatre in Santa Monica, and the red-carpet pageant is donating a portion of its proceeds to Operation Blankets of Love, a non-profit providing comfort and homes for homeless pets. Rice has more than 16 years experience in pageantry and won her first title as Miss California Teen All American 2000. She has also appeared in more than 30 national commercials and more than a dozen films and television shows. Rice enjoys teaching the girls runway walking, posing and interview skills.